If you were a knight in the Middle Ages, you would wear a shining array of metal plates. If you were a samurai in feudal Japan, you’d rock a combination of layers made of iron and leather. If you were one of the Lost Boys, you’d wear whatever totally fictional armor the Lost Boys wore (in addition to eating imaginary food). Anyway, the point is, the rowdy, go-getters of the day always had an outfit aimed to suit their rambunctious endeavors, and the same is true today. 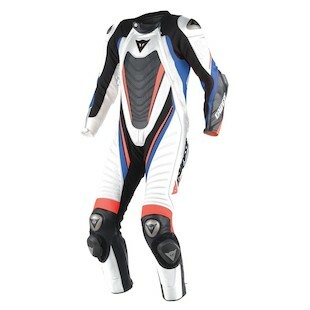 For those who like to go fast on two wheels, that signature piece of gear is a Dainese Aero EVO D1 Race Suit. In taking the trickle down knowledge that has been gleaned from countless hours of R&D for the MotoGP series, the Aero EVO D1 suit is a truly feature-rich option for track day riders throughout the world. Geared for the higher caliber rider who is going to push it to the extreme, the Aero EVO D1 is ample in its responsive features as well as its ability to support your desire to go the extra mile (or miles per hour!). Constructed from top-grade D-Skin 2.0 leather and S1 bi-elastic fabric for an incredible mixture of style, protection, and all-day comfort, the Aero Race Suit showcases the Dainese style in full form. Additional features include extra elastication in the abdomen for increased flexibility, an InnerTech gloves-to-sleeve attachment system, and a pocket that has been prepped for a hydration pack to fuel you as you work hard on the go. History is a constant lesson. It has taught us a great many things. One of those things is that dressing the part is not just for show. Dainese took that lesson to heart and has created the Aero EVO D1 Race suit for ardent track day enthusiasts and sportbike riders around the world.